Do you want to transfer funds (Money) online to any bank account? First, you need to add that person’s bank account as a beneficiary (Payee) and then you can transfer money to his/her account. India’s largest bank state bank of India providing Internet banking facility absolutely free of charge. Any customer of SBI can apply for Netbanking & use it for money transfer, view statements, manage account online, mobile banking, recharges, pay bills and lot more. 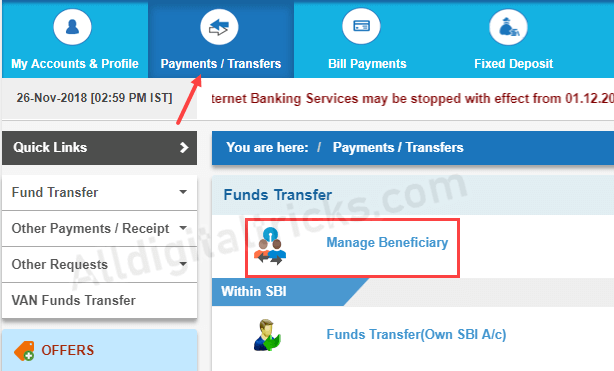 Today we will show you how to add beneficiary account in SBI online through net banking. Without Adding beneficiary, you can not transfer money to any other bank account above 10,000 amount. For online fund Transfer on net banking, first register person’s bank account as a beneficiary. Recently SBI launched Quick transfer facility that is enable you to transfer Rs.10,000 daily without adding Beneficiary, ya this is amazing. But to send above 10,000, you must Add beneficiary. Ok, let’s see how you can so that from Internet banking. The first thing is you must have an Internet banking facility, now you can also activate SBI internet banking online. To do this you just need registered Mobile number with your account and Debit card. Login to your internet banking. visit: https://www.onlinesbi.com, enter your user ID and password and login. 1 After login click on Payments/Transfers tab and then click on Manage Beneficiary. Next screen you have to enter profile password to access profile section, enter profile password and proceed. 2 After entering Profile password, now you can see Manage Beneficiary screen where you can add the different type of beneficiaries. You just need to above three beneficiaries to send money online to any bank account. You can add as your requirement. ok so let’s add one by one. If you are going to transfer fund to other person’s SBI account, then you first need to add his/her account as an Intra-bank beneficiary. Intra means SBI to SBI. The money will be credited to the beneficiary account instantly. Now we need to Approve beneficiary. Next screen click Approve now. (You can also approve later by clicking on Approve). 3 In Approval type select Approve beneficiary. 4 Next screen you can see 2 options for approval. Select Approve through OTP option. 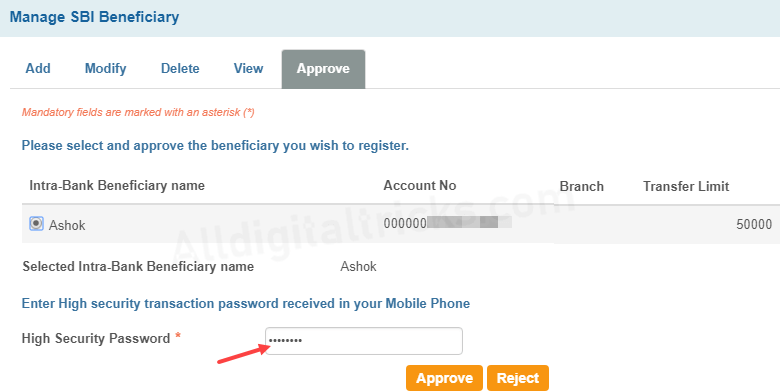 5 Next, enter OTP password which you received on your mobile number and click Approve button. That’s all, you have successfully added Intra-bank beneficiary. It will be activated after 4 hours and then you can able to send money to other SBI Account. If you are going to transfer fund to other Bank account, then you first need to add his/her account as an Inter-bank beneficiary. Inter mean SBI to another bank account like ICICI, HDFC and other banks. The process is same as above. 2 Next screen you need to enter the person’s bank account details. After adding details click on SUBMIT. 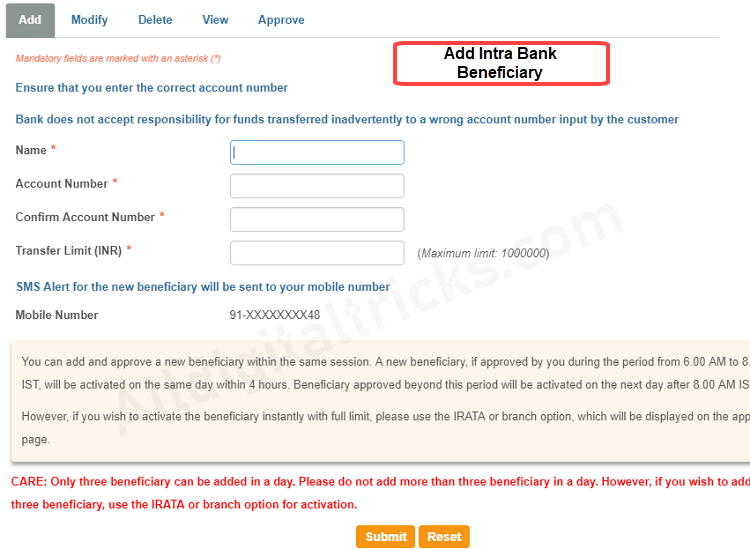 Now follow beneficiary approval process using OTP as mentioned above. The beneficiary will be activated within 4 hours and then you can transfer money to his/her bank account. 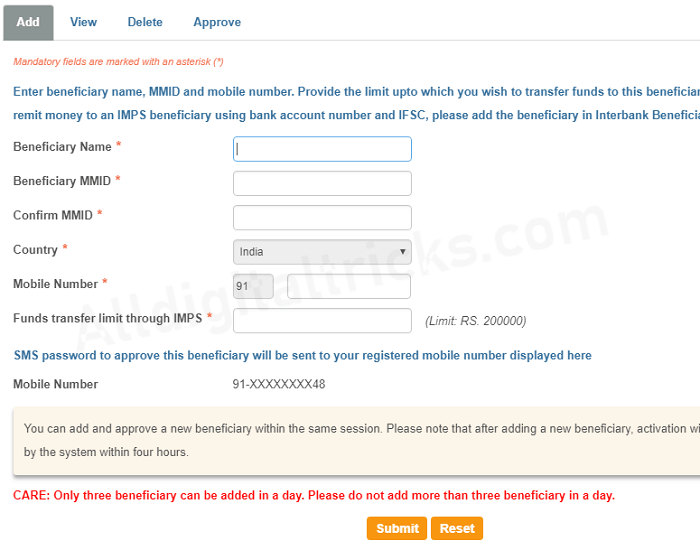 If you want to send money through IMPS (immediate payment service) using MMID and Mobile number then you can add IMPS Beneficiary. The maximum transfer limit is Rs.200000 per day in IMPS. 1 To add click on IMPS Beneficiary. 2 Next screen, enter account holder name, MMID, mobile number and transfer limit under 2 lac. Now click on submit. Now follow the approval process as mentioned above using OTP. 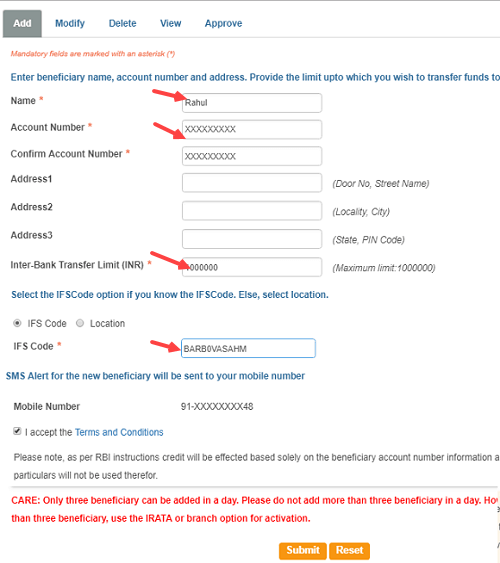 So this is how to add Beneficiary in SBI using net banking for fund transfer. After adding beneficiary now you can transfer money to any bank account using NEFT, IMPS, and RTGS. Update: And now you can also use SBI Mobile banking facility to add the beneficiary. For all transfer of funds OTP has been asked to be entered but OTP I do not get promptly through my registered mobile phone number. As such, I had to wait and watch and ultimately forced to cancel the t ansaction. How you can solve the problem? Previously, I Used to get OTP promptly. Nowadays, this get delayed and my attempts for payments by transfer through Mobile/Net Banking becomes useless. And waste of time. Please let me have your suggestion. Sometimes same problem i faced. Kindly restart your mobile and check.